This is what is often said when it comes to fire. Yet those businesses who are unfortunate to have a fire, 95% of them fail to recover from such a tragedy. So what can we do to safeguard this from happening to us then? Firstly a bit of history, In October 2005 the UK fire safety legislation was changed. The many different parts of fire law was either replaced, amended or simplified to form the Regulatory Reform Fire Safety Order 2005. Prior to this, it was the responsibility of the fire authority to visit premises, carry out fire risk assessments and issue fire certificates. The onus is now placed fully on the ‘responsible person’ to carry out their own fire risk assessments. 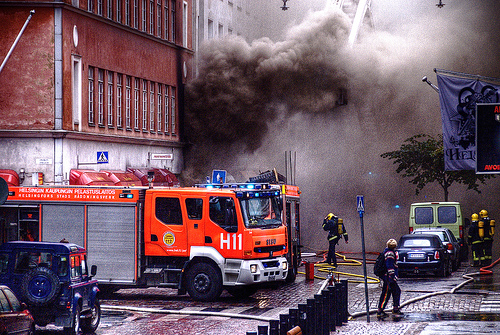 The fire service has the responsibility to police the RRO and have more power than the police to enter buildings as they do not require warrants to do this. Fire officers generally look for and ask for your fire risk assessment, emergency plan and fire records. They will also do an inspection of the building and if they feel there are insufficient fire safety measures in place they have the power to close it down. So the first thing we must have in place then is a fire risk assessment. This is a legal requirement and should be documented should you employ five or more people however the fire law doesn’t stop there. You also require a documented fire risk assessment should you manage/own or are deemed the ‘responsible person’ on the following: shared houses, houses of multiple occupancy whether licensed or not, blocks of flats, hostels, small care homes, B&B’s, guest houses, holiday lets and hotels. The Regulatory Reform Fire Safety Order 2005 (RRO) states that if you feel you are competent enough to carry out a fire risk assessment then you can do one yourself however there have been many cases of fines and prosecutions from the fire authorities for insufficient and poor fire risk assessments click here for an e.g. A lot of companies are getting theirs done by professionally qualified fire risk assessors not only is it saving them time and therefore money it could also save lives too. Okay, so once you have had your fire risk assessment done. What next? You should then start to complete the action plan. This part of the fire risk assessment has a list of prioritised jobs with a timeframe of when each task must be completed by. It is crucial getting this done as soon as possible and definitely before the suggested completion date as any kind of delay could jeopardise your fire safety and therefore your business. Your fire risk assessment is a live document and should be reviewed regularly; there is no set time on how often you should get this done. Good practise is getting it reviewed on a yearly basis however should you have any changes in your workforce, work practices, have any internal/external work done to your workplace or have had a fire then this is also a time to re-examine it. What else should I know and do? Should you have fire extinguishers in your premises then by law they must be serviced annually by a ‘competent’ engineer. Fire alarms must be serviced every six months and emergency lighting every twelve. All details of servicing must be recorded in a fire log book and must be made available at any time for the fire authorities. If you have fire extinguishers on site then you must be suitably trained to use these and have had training on basic fire awareness too. For larger premises you must have fire wardens and of course these must be trained too. If you need help with any of the above we can assist you in this as we offer a complete fire safety solution and are not only competitive but also offer excellent customer service just take a look at out testimonials.